The octopus brain is evolutionarily different to mammalian brain by not being surrounded by a bony case. So can an octopus have a brain concussion ? Lets investigate. If we define a concussion as the rapid deceleration in a gravity field distorting a brain into tension changes during rapid elastic distortions dependent on the shape characteristics, what of an entirely soft body, especially also within the head structure? 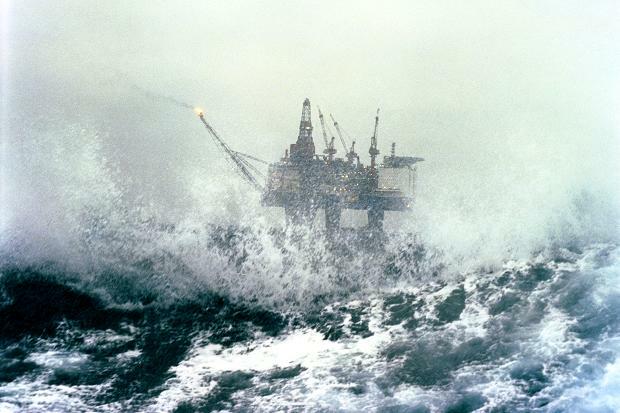 But where does the excess energy go, which structures are really vulnerable ? Each arm of the octopus is independent without the requirement of a central brain to coordinate its delicate motions. Large octopus in captivity when threatened by a shark are not only able to subdue the shark but to actually wrap up the shark like holding a FedEx package, so that the shark suffocates by not being able to push water through its gills. So how do we define intelligence in such a creature? How did Nature solve this problem ? 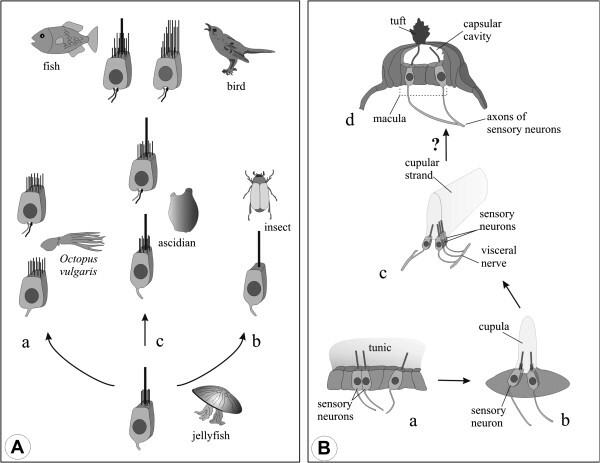 Are octopus immune to deceleration trauma to their self sensing? Do octopus have a sense of humour? ” Octopuses have a pouch-shaped body and eight powerful arms (not tentacles), usually with two rows of suction discs on each. They don’t have any bones, but in some cases, the brain may be enclosed in cartilage. Their size can range from 1.5 cm (0.6 in.) to more than 5 m (16 ft.); spans of up to 9 m (30 ft.) have been recorded, although these measurements are often considered questionable. The arms usually make up about half their span. Their skin has amazing abilities. Octopuses can change their colour to match the background and thus provide camouflage. They can change the colour pattern in order to communicate with other octopuses. They can also change the texture of the skin’s surface to further help them blend with their surroundings. They inhabit many diverse regions of the ocean, especially coral reefs. Octopuses also have a sac that contains an inky substance. When an octopus senses danger, it ejects some “ink”. 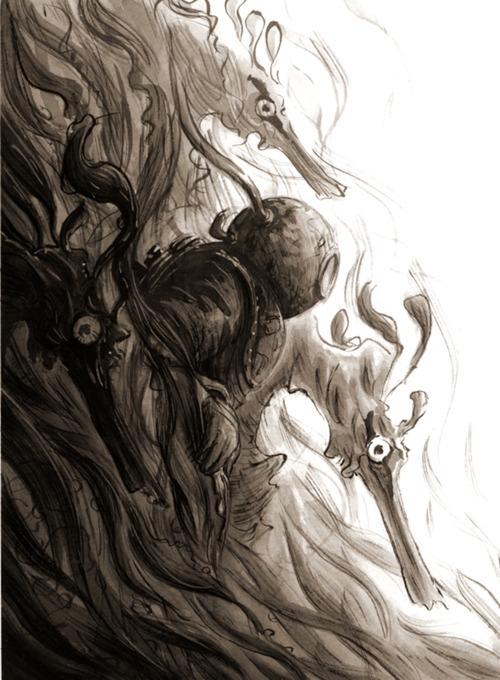 The ink darkens the water, thereby screening the octopus from the other animal. In some species, the saliva—deployed by a beak bite—can also paralyse prey. Octopuses can travel through water by jet propulsion: they take in water and forcibly eject it through a funnel, using the contraction of their muscular mantle (the layer of tissue that encloses the body). They usually use this method only when trying to escape from danger or when catching prey. They are also able to creep over hard surfaces using their arms, and indeed, this is how most octopuses move around most of the time. 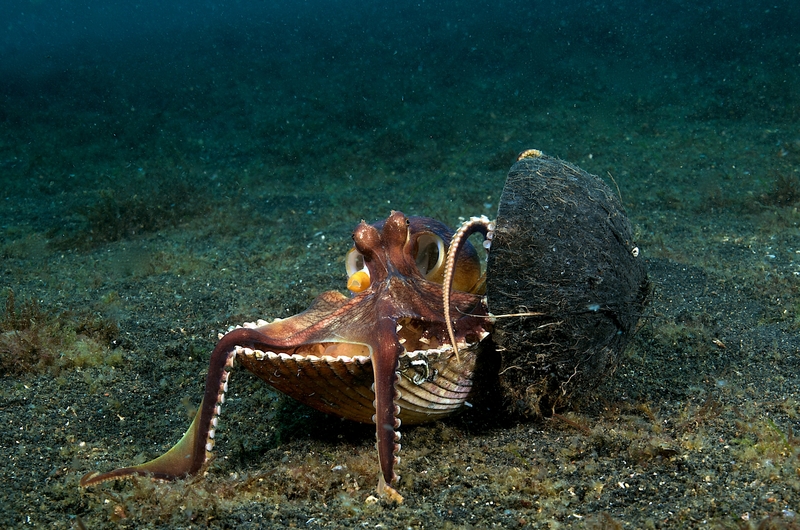 When hunting and grabbing dinner, the octopus uses all the flexibility the arms are capable of. But to bring captured prey to its mouth, the octopus turns the arm into a semi-rigid structure that bends to form quasi joints. Just as a human arm has joints at the shoulder, elbow, and wrist that allow our arms to bend and rotate, the octopus bends its arm to forming three segments of roughly equal length. The motions of each arm are run by a complex system of about 50 million neurons that encodes the movements necessary for making coordinated movements. The octopus has the most complicated brain of all the invertebrates. The octopus brain is estimated to have 300,000,000 neurons. These neurons are arranged in lobes and tracts that are more specialized than ganglia. An octopus has the most advanced memory of the invertebrates plus is a rapid learner. Understanding how the octopus controls eight flexible arms all at once could be the basis for developing the next generation of flexible robotic arms—long a goal among robotics engineers. “There have been numerous accounts of (and searches for) an as yet unknown species of deep-sea octopus that is believed to grow to over 100 feet (30 meters) across and weigh several tons. 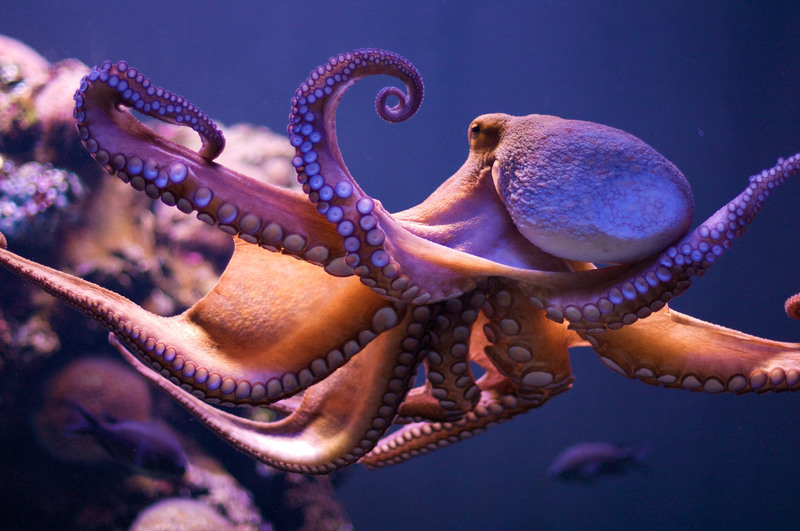 Octopuses have intrigued scientists for years, because they have both long- and short-term memory. They remember solutions to problems. They can go on to solve the same or similar problems. They have been known to climb aboard fishing boats then open holds in search of crabs. They can figure out mazes, open jars, even to break out of their aquariums in search of food. The arms are composed almost entirely of muscle, with no bone or external skeleton—a structure known as a muscular hydrostat. Elephant trunks and tongues are other examples of a muscular hydrostat. Earlier research funded by the U.S. Navy’s Office of Naval Research (ONR) suggests that, to keep the arms from constantly tangling themselves up, each arm has an independent peripheral nervous system and neural circuitry (see related-story link below). This allows the brain to essentially give a command—”Arm Four, fetch that tasty crab crawling by”—and have the arm carry out the order without the brain thinking about it again. This ability is combined with excellent eyesight. Once an octopus spots its prey, it has a remarkable ability to reach out with one of its arms and grab it with one of the suckers that form a double line up each of the octopus’s arms.” The eye of the octopus is very similar to that of vertebrates in that it has a cornea, lens, iris and retina. It can also focus and form images. The vertebrate eye focuses by changing the shape of the lens. 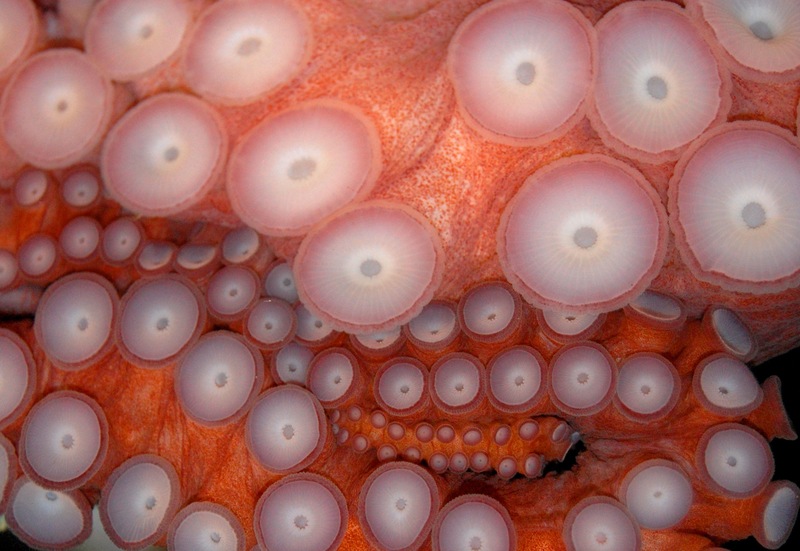 Octopi can see shape, color intensity, and texture. Octopuses are thought to be one of the most intelligent invertebrates and can change the color and texture of their skin to blend in with rocks, algae, or coral to avoid predators. 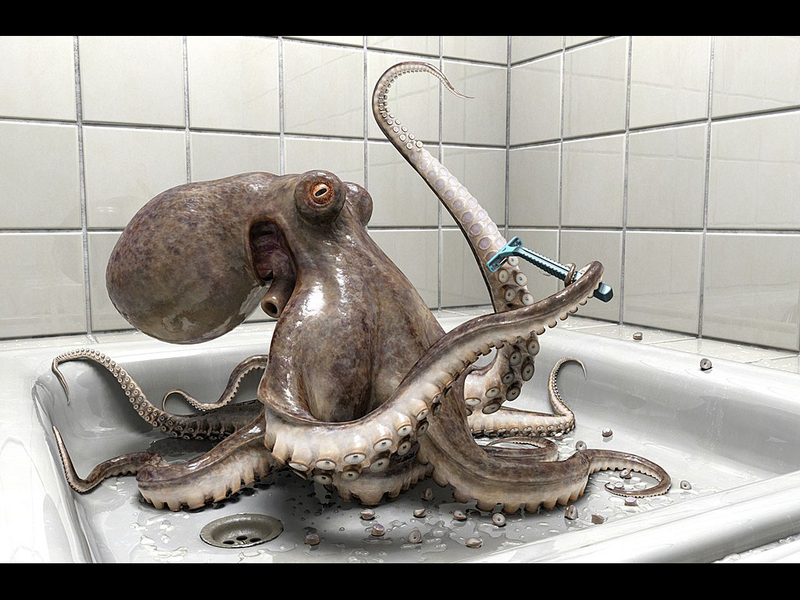 But until now, an octopus with the ability to actually assume the appearance of another animal had never been observed. Norman and fellow researchers Julian Finn of the University of Tasmania in Australia and Tom Tregenza of the University of Leeds in England describe the octopus mimic in the September 7 issue of Proceedings of the Royal Society of London. Mimicry is a fairly common survival strategy in nature. Certain flies, for example, assume the black and yellow stripes of bees as a warning to potential predators. But the adaptable octopus is the first known species that can assume multiple guises. • Sole fish. To take on the appearance of flat and poisonous sole fish abundant in the habitat, the octopus builds up speed through jet propulsion and draws all of its arms together to form a leaf-shaped wedge. It then undulates in the manner of a swimming flat fish. • Lion fish. Just above the seafloor the octopus swims with its arms spread wide and trailing from its body, mimicking the lion fish and its poisonous fins. • Sea snakes. Changing its color to imitate the yellow and black bands of the toxic sea snake, the octopus threads six of its arms into a hole and waves the other two arms in opposite directions so they look like two snakes. One reason why the researchers had not discovered the octopus previously is that it lives in a habitat that’s not very appealing to scuba divers—a muddy and relatively barren landscape that lacks the variety and splendor of life found in coral reefs. “These boring environments are just the place where you might see the most exciting behavior of animals,” he added. The researchers believe the recently discovered octopus uses its mimicry to avoid predation by large fish rather than as a mechanism to trick its prey. They also think it probably evolved from another species of octopus that’s active during the day in coral reefs nearby. The fact that the octopus can adopt so many different animal impersonations greatly reduces its likelihood of encountering predators. This is advantageous, said Tregenza, because if a predator fish often saw a lion fish that looked suspiciously like an octopus, the predator would eventually be more willing to risk being poisoned by taking a bite of its prey—thus blowing the octopus’s cover. Tregenza said the octopus may decide which creature to impersonate depending on what particular predator is near. Evidence of such behavior came from observations showing that when the octopus was attacked by territorial damselfishes, it mimicked one of the fishes’ common predators, the banded sea snake. “If the mimic octopus can figuratively use its mimicry—that is, can choose to use a particular form in response to a particular threat—this could potentially dramatically improve the defensive value of its mimicry behavior,” said Tregenza. We have suspected based on the large amount of nerves in the octopuses and from the behavior of severed arms during predation,” said James Wood of the National Center for Cephalopods at the University of Texas in Galveston. “Arms have a lot of autonomy and the central brain of an octopus gives high-level commands but may not be aware of the details—in other words, there is a lot of processing of information in the arms that never makes it to the brain,” he added. This research shows the mechanism by which octopuses are able to operate an arm that has a nearly infinite range of motion. This has been a long-term goal of the Israeli researchers not only because of their interest in nature, but also to learn how to produce a flexible and robust robotic arm. Now that the researchers have figured out how octopuses control their flexible arms, the next challenge is to find a material that can replicate the property of an octopus arm. Currently nothing comes close, said Hochner. In the meantime, scientists will remain awed by the intelligence of octopuses, which are thought to be the most intelligent of the invertebrates (species that have no spine). “This [research] shows that centralized processing of all incoming information is not the only way to develop a neural network,” said Wood. With their jet propulsion there is always the risk of a collision into something. But being invertebrates the brain is not inside a bone vault. Enormous brain flexibility allows them to squeeze virtually bounded by the limits of the dimension of their beak. In terms of collision risk their ability to deform is a superb strategy toward deflecting any deceleration energy during any brief impact. Their cloaking ability to either mimic other fish is probably one of the best cloaking skill sets of any creature on the planet. They have evolved a superior intelligence capable of eluding the various predators that share their range of activities. They are both strong yet flexible with no bones to break. But they are still vulnerable. Can a octopus endure a concussion ? What is the first response inside the brain as the concussion deceleration hits? It is the instantaneous movement sensed within the vestibular system in this case within the statocyst. Where the destructive energy comes into play is from sound waves as vibrations rather than collision energy. This man made sound energy that eventually concusses the octopus brain as an impacting energy cascade starting within the gravity sensor of the animals position, within their statocyst. Giant squid, for example, were found along the shores of Asturias, Spain in 2001 and 2003 following the use of airguns by offshore vessels and examinations eliminated all known causes of lesions in these species, suggesting that the squid deaths could be related to excessive sound exposure. Michel André, Technical University of Catalonia in Barcelona, and colleagues examined the effects of low frequency sound exposure — similar to what the giant squid would have experienced in Asturias — in four cephalopod species. As reported in an article published in Frontiers in Ecology and the Environment, a journal of the Ecological Society of America, all of the exposed squid, octopus and cuttlefish exhibited massive acoustic trauma in the form of severe lesions in their auditory structures. The researchers exposed 87 individual cephalopods — specifically, Loligo vulgaris, Sepia officinalis, Octopus vulgarisand Illex coindeti — to short sweeps of relatively low intensity, low frequency sound between 50 and 400 Hertz (Hz) and examined their statocysts. Statocysts are fluid-filled, balloon-like structures that help these invertebrates maintain balance and position — similar to the vestibular system of mammals. The scientists’ results confirmed that statocysts indeed play a role in perceiving low frequency sound in cephalopods. André and colleagues also found that, immediately following exposure to low frequency sound, the cephalopods showed hair cell damage within the statocysts. Over time, nerve fibers became swollen and, eventually, large holes appeared — these lesions became gradually more pronounced in individuals that were examined several hours after exposure. In other words, damage to the cephalopods’ auditory systems emerged immediately following exposure to short, low intensity sweeps of low frequency sound. All of the individuals exposed to the sound showed evidence of acoustic trauma, compared with unexposed individuals that did not show any damage. The effect of noise pollution on marine life varies according to the proximity of the animal to the activity and the intensity and frequency of the sound. 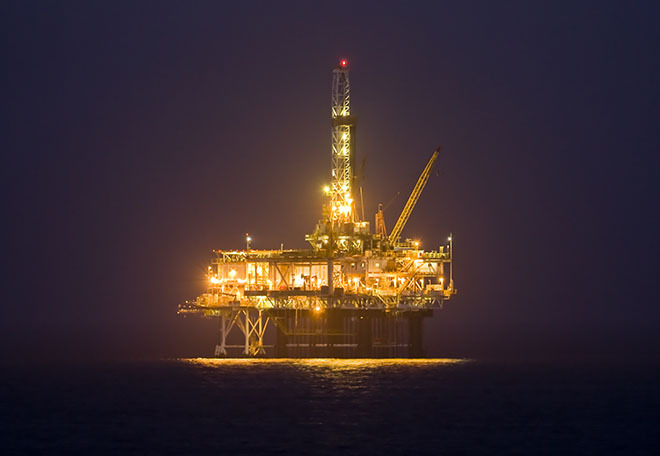 However, with the increase in offshore drilling, cargo ship transportation, excavation and other large-scale, offshore activities, it is becoming more likely that these activities will overlap with migratory routes and areas frequented by marine life. What happens then to an octopus orienting to man-made low-frequency sound ? The response of orientation is a vestibular reaction within the octopus repertoire of dedicated fine motion. The destruction of fine hair cells dedicated to hearing is the beginning of a cascade of injury that starts with excessive sound waves as the input that deregulate the statocyst vestibular system, literally unbalancing the octopus capacity to defend itself using all its camouflage altering tricks. The response from an octopus having a concussion resolves not into a abrupt collision with an object but rather a collision with sound sensed first within the hearing apparatus which is intimately linked within statocyst head positioning as gravity sensing. The apparatus of vulnerability within the octopus is its statocyst affected positioning ability that can become injured. Octopus concussions occur as vestibular injuries that impact the very survival skills of these very intelligent creatures. What is to be learned from these elegant creatures is their exquisite sensitivity as a vulnerability of their gravity sensing statocyst. 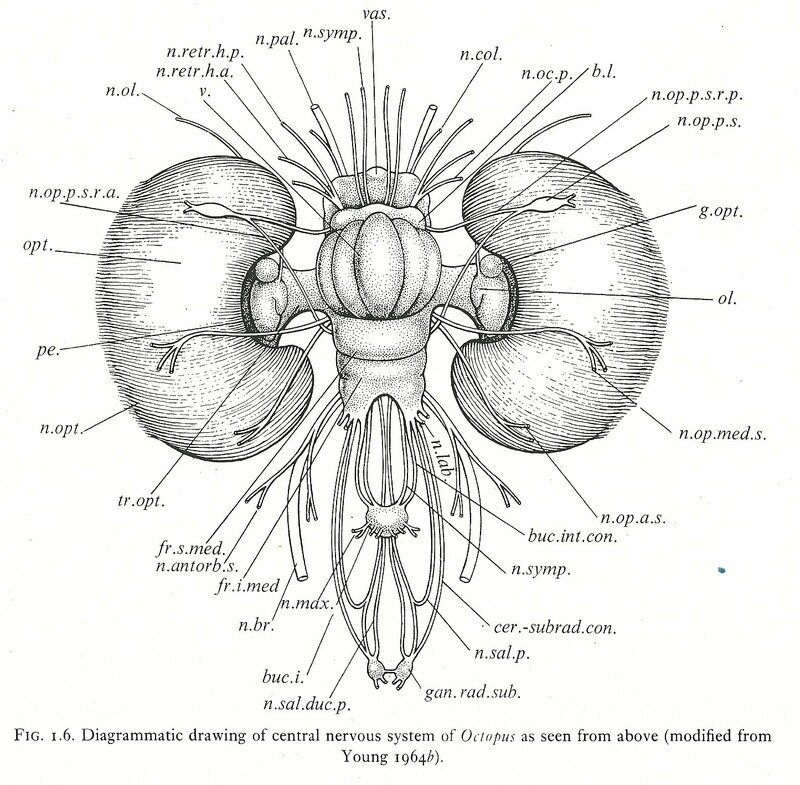 The statocyst itself is a biomineralized, structure the only hard substance in such a mobile elastic body. What Nature appears to be revealing is to comprehend how energy in the form of vibration, in the form of disturbing orientation within gravity orientation involves sensing gravity inside a hard substance affects directly the octopus ability to move – to perform its elaborate camouflaging skills. Once the octopus sensing of gravity is injured the octopus is at great risk to be attacked by the surrounding presence of predators.